And what is Francis' vision for the church? The document’s overall message is that Catholics should be unafraid of new ways of proclaiming the Gospel and new ways of thinking about the church. In fact, such new ways are essential if we are to spread the Gospel at all. This may sound like boilerplate talk expected in a document on the “New Evangelization,” but it is not; for in the document Francis identifies areas of petrification in the church, areas where he wants to see real change. This is not to say that the Evangelii Gaudium seeks to overturn traditional church teachings. Instead it seeks to overturn the way that we have done things, and to be fearless in doing so. For example, while he reaffirms the church’s inability to ordain women as priests, he also invites the church to think about their place in the church in new ways, to imagine “the possible role of women in decision-making in different areas of the Church’s life." Nor does the Pope have patience for people who are “tempted to find excuses and complain.” Essentially, he contrasts this dourness and pessimism with the joy of living a life centered in Christ and focused on the hope of the resurrection. It is a hope-filled, positive and energetic view of the church actively engaged with the world. Evangelii Gaudium is difficult to summarize, so wide-ranging is it. Ironically, something that would at first appear to be a narrow topic - how to spread the Gospel today - offers Francis the latitude to address many topics in his trademark open style. The exhortation moves easily from a discussion on joy as a requirement for evangelization, to how “personal dialogue” is needed for any authentic invitation into the faith, to the difficulty of being a church when Catholics are “warring” against one another, to the need for priests and deacons to give better homilies, to an overriding concern for the poor in the world - the last being a special concern of the Pope. To that end, some will be surprised that Francis champions an idea that has lately been out of favor: the church’s “preferential option” for the poor. “God’s heart has a special place for the poor,” the Pope says. But it is not enough simply to say that God loves the poor in a special way and leave it at that. We must be also vigilant in our care and advocacy for them. Everyone must do this, says the Pope. Most Catholics will, like me, read the letter with enthusiasm. But some Catholics have criticized the Pope for trying to change too much in the church - even though no dogma has been altered. A few Catholics are not only beginning to critique him, but even worse, fear him. Change seems to be something to fear. As one of my Jesuit friends used to say, playfully, “I’m against change; even change for the better!” But the church must change if it is to grow - not in its core beliefs, but in the way that it lives out and shares those beliefs. 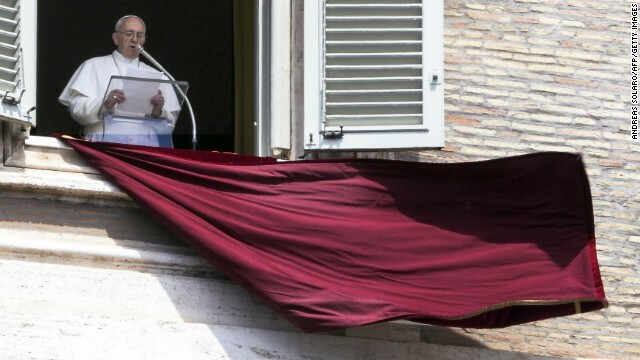 Evangelii Gaudium is Francis’ own ringing response to prophets of doom. It's simple. If complaints are made about child molesters – just have that diocese file for bankruptcy like the one in Montana is doing RIGHT NOW because of its hundreds upon hundreds of child molestation charges that have been brought against its priests. That's right – while your cult sits on trillions upon trillions in art treasures, gold & real estate – claim you're bankrupt so you can sidestep the responsibility of the child molesters in your ranks. That's a pretty bold new vision – alright!!! in my humble opinion its not just a case of opening the chruch to the outside new world but also of finaly brining th e old beliefs and evangelical cornerstones back into the forefront. finaly the church is telling the world and its own memmbers that preaching a thing and acting in contrast to that wat u preach is simply no longer accepted its own clergy should praktis wat they preach members of government should start acting like the responsible persons they are swonrn to be not just enabling legislation because some big business payed them a big paycheck to pass it and we the citizens should start acting like responsible folks and consider wat we see as the core belief no mater wich religion u uphold in other words no mater wat u beleief consider why u belief it instead of blindly following the lore of clergy men that most of the time have a hidden agenda dear to ask that most horible of questions to any person in power WHY!! "This is not to say that the Evangelii Gaudium seeks to overturn traditional church teachings." If it is the same teachings, then it is neither bold nor new. This 'religion' must give proof to it's claims of "truth" before any credibility be given to it; otherwise this religion is a fraud and must be declared illegal. And parents charged with child abuse for 'brain-washing' with fallacies. Bravo to Pope Francis! I agree with his bold vision a 99%. The remaining 1% is a grave concern that reality may threaten the Church! I exemplify this on the Holy Father's own words: " that the Evangelii Gaudium seeks not to overturn traditional church teachings." As some of you may have heard, this very moment, the European Union is threatening Poland that it accept the "gender ideology", destroying all that is Catholic teaching with respect to traditional family! ! Is this not an attempt to overthrow traditional church teachings? It is! But the Pope has mot yet noticed the mortal danger, and keeps saying: "ignore the gender ideology"! Focus on the poor! I am in agreement: the poor are a priority. But should not the Church also focus, at least in 1% on those dangerswho threaten her very being? I used to be a hindu believer who around 7 years ago, made the change over to atheism. I always supported the right for people to believe in a religion, regardless of how crazy or illogical it might be. Ideally and theoretically, religion gives an overall positive force to the universe. For me personally, however, experiences in life and my fascination with history have taught me that most of the time, nothing good comes of religion. If feel that its the same today with people proclaiming themselves to be Hindu or Christian or Muslim or Jewish or believers of any other religion, and they commit horrible atrocities against humanity in the name of that religion. With the decreasing morality of society in terms of barring civil rights and people everywhere running down the person next to him rather than helping him, especially at an economic level, with the change from doing things for the common good or for the good of the country to doing things selfishly, I always thought religions was just a way to justify crimes and atrocities. It was a figment of the imagination of millions of people to help people live with what they've done. But Pope Francis? I have to say, he is the one true hope for religion I have seen in a very long time. He gives religion a good name. He truly stands for what religion is all about. To help those in need, to help those who have committed crimes to repent, and to bring more peace and harmony to the world. To bring mercy and forgiveness, charity and heart, spirituality and love. Yes, but he says it all while living in a palace...whats up with THAT!!! I really like what he is doing.